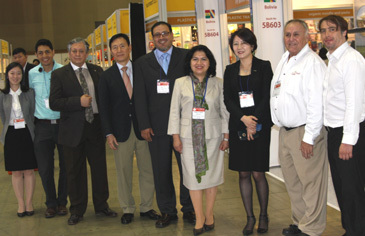 Bolivian Ambassador Guadalupe Palomeque de Taboada (4th from right) poses with Bolivian exhibitors and othe guests at her booth at "Seoul Food 2016" held at Kintex in S. Korea on May 10-13, 2016. "Seoul Food 2016," South Korea's largest exhibition of food industry, kicked off on May 10 (Tuesday), 2016 for the four-day official run at Kintex in Ilsan west of Seoul. A total of 1,511 food-related companies from 46 countries are taking part in the exhibition this year. Among them are 845 domestic South Korean exhibitors. The Asia's one of the four major food exhibitions was organized by KOTRA (Korean Trade-Investment Promotion Agency), a trade promotion arm of South Korea. The 34th annual event is the largest one ever, according to the organizer. The first exhibition was held in 1983. Mr. Antonis Gravanis (right) of "Enterprise Greece" poses with his Korean interpreter at his booth. A series of the latest trends in food industry and food-related technology are being introduced in this year's food exhibition under the slogan of "Delight Your Taste Buds." "Seoul Food 2016" was designated as nation's best exhibition this year for the seventh year in a row by South Korea's Ministry of Trade, Industry, and Energy (MOTIE). According to the organizer, export assistance programs for the domestic food companies were bolstered in this year's exhibition. In particular, advisory meetings for domestic Halal food manufacturers were held to help them for the export of their Halal food products. A variety of seminars and workshops are also being held for the South Korean food companies for their global marketing. Some 750 buyers from foreign countries are expected to visit the exhibition venue for the duration of four-day event. Organizer said that a Uzbekistan's state-run company signed a 400,000-US-dollar deal with a South Korean company to import production line equipment for the grain processing. 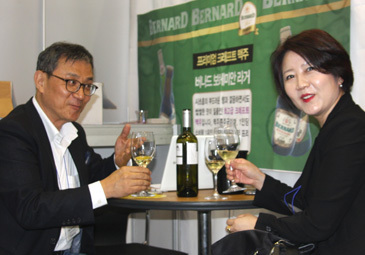 Mr. Han Heung-Sup (left) offers Czech wine to Madam Lauren Sung, US businesswoman, at his booth at "Seoul Food 2016" held at Kintex in Korea on May 10-13, 2016. Mr. Han, Korean businessman residing in Switzerland, is the promoter of Czech wine. Hundreds of exhibitors were quite busy offering their products to the visitors in the spacious exhibition halls. "I am proud of introducing Czech wine to South Korea," said Mr. Han Heung-Sup (HS), a South Korean businessman residing in Switzerland. "The exhibition is a great opportunity for the introduction of Czech wine to the local Korean people." Mr. Han promotes Czech worldwide as a chief member of "Wine of Czech Team." At his booth Mr. Han was introducing a series of white Czech wine to the visitors. Also at his Czech wine booth was Marketing Director Kim Seung-Beom of B&C Corporation, importer of Czech beer brands. He was offering a sample glasses of "family brewery Bernard" beer to his visitors. Marketing Director Kim Seung-Beom of B&C Corporation poses with his Czech beer brands at "Seoul Food 2016" held at Kintex in South Korea on May 10-13, 2016. Mr. Antonis Gravanis of "Enterprise Greece" was introducing various olive oil to the local Koreans visiting his booth filled with many olive oil-related products. He is deputy head of his company's Agricultural Products and F&B Trade Promotion Unit. "I want Korean people to know more about the olive oil products of Greece," he said. "This exhibition is a good case to show our products." Some foreign ambassadors visited booths of their nation's companies while others were hosting presentation events to promote their products at the exhibition area. At the exhibition area Bolivian Ambassador Guadalupe Palomeque de Taboada hosted a presentation meeting for businesspeople from Bolivia on May 11 (Wednesday), 2016. At the presentation General Manager Mijail Loredo of "Agro Export" and General Manager Jorge Camacho of "Gold Foods SRL" enterprise made a presentation on Sesame and Chia, respectively. From Asia: South Korea, China, Japan, Taiwan, Hong Kong, India, Indonesia, Vietnam, Philippines, Malaysia, Thailand, Sri Lanka, New Zealand, and Australia. From Europe: Germany, England, France, Italy, Spain, Portugal, Denmark, Netherlands, Austria, Ukraine, Turkey, Poland, Hungary, Lithuania, Belgium, Croatia, and Cyprus. From America: USA, Canada, Mexico, Cuba, Argentina, Chile, Colombia, Peru, Ecuador, and Bolivia. From Africa: South Africa, Kenya, and Mozambique.